In response to popular customer demand, Emirates will provide an all-A380 service on its Beijing (PEK) and Shanghai (PVG) services when it upgrades the second daily flights, EK308/EK309 on its PEK route and EK304/305 on its PVG route, replacing the current Boeing 777-300ER operations. The move, effective from July 1 2017, will increase capacity to both Beijing and Shanghai, offering Emirates passengers even more seamless A380-to-A380 connections between the two Chinese cities and over 30 international points, including 18 points in the UK and Europe, via its hub in Dubai. This upgrade strengthens Emirates’ overall mainland China offering, which also includes services to Guangzhou, Yinchuan and Zhengzhou. The additional seats on the routes will support more business and leisure travel departing from and arriving in China, while offering passengers an exceptional global travel experience. The popular Emirates A380, which offers up to 519 seats in a three class configuration on Chinese routes, now flies to seven North Asian cities, including Beijing, Shanghai, Guangzhou, Hong Kong, Taipei, Seoul in South Korea and Narita, Japan. On Emirates flights to and from China, passengers in all classes can enjoy local Chinese cuisine, and industry-leading service from Chinese-speaking cabin crew. Passengers can also enjoy over 2,500 channels of the latest films and TV shows, including Chinese content, as well as music and games on Emirates’ ice Digital Widescreen, which has been named World’s Best Inflight Entertainment at the prestigious Skytrax World Airline Awards for a record 12 years running. Emirates was also named Best Airline in the World in TripAdvisor Travelers’ Choice Awards for Airlines 2017. First and Business Class passengers on the Emirates A380 can spend time during their flight socialising in the popular Onboard Lounge on the upper deck of the aircraft, and First Class passengers can enjoy exclusive use of the on-board shower spas to refresh during flights. Premium customers are also offered complimentary chauffeur drive services to and from Beijing and Shanghai airports, lounge access and priority check-in. Emirates also offers generous baggage allowances, with up to 35kg in Economy Class, 40kg in Business Class and 50kg in First Class. Shanghai was Emirates’ first Chinese destination. 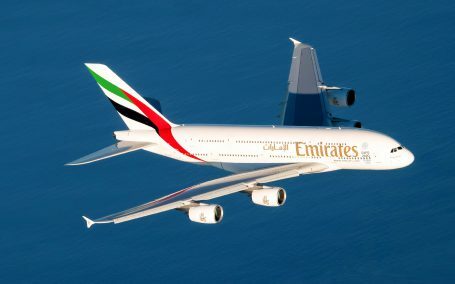 As the first airline to establish non-stop connectivity between the Middle East and mainland China, Emirates launched freighter operations to Shanghai in 2002, followed by passenger services to the city in 2004. Launched in 2006, Beijing routes first deployed the A380 service in August 2010, when Emirates became the first international airline to fly this award-winning aircraft on Chinese scheduled passenger routes. Today, with 38 weekly flights to China, Emirates enables convenient connections to over 150 cities in more than 80 countries in the world, including 38 destinations in Europe, 20 destinations in Africa and 15 destinations in Middle East, among others. Emirates is the world’s largest A380 operator with 95 of the double-decked aircraft in its fleet and a further 47 on order. The flagship of Emirates’ all wide-body fleet, the A380 is extremely popular with travellers for its comfort and industry-leading on-board features. As the first and only airline in the world to operate a fleet of all Airbus A380 and Boeing 777 aircraft for its passenger flights, Emirates’ operating fleet remains modern and efficient while offering customers a high level of comfort. Since 2008, Emirates has flown over 80 million passengers on its A380 fleet.